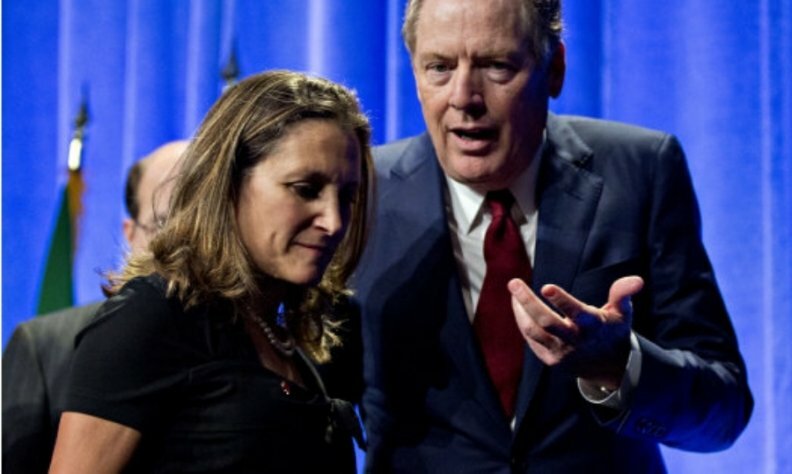 WASHINGTON -- Canada's top trade negotiator joins her Mexican and U.S. counterparts in Washington on Tuesday in a bid to remain part of a trilateral North American trade pact, as U.S. officials expressed optimism a deal could be reached this week. Ottawa is under pressure to accept new terms on auto trade and dispute settlement rules after the United States and Mexico agreed on Monday to overhaul the North American Free Trade Agreement. Canadian Foreign Minister Chrystia Freeland rejoins the year-long talks following a hiatus of several weeks as the United States and Mexico ironed out outstanding bilateral disagreements in the renegotiation of the 24-year-old accord. U.S. Treasury Secretary Steven Mnuchin told CNBC on Tuesday that he believed the United States could also reach a trade deal with Canada this week. "The U.S. market and the Canadian markets are very intertwined," Mnuchin said. "It's important for them to get this deal and it's important for us to get this deal." Mexican Foreign Minister Luis Videgaray told Mexican television on Tuesday the three sides would work for a three-way deal. "We are now going to devote long hours to the negotiation with Canada," he said. Negotiations among the three partners, whose mutual trade totals more than US$1 trillion annually, have dragged on for more than a year, putting pressure on the Mexican peso and the Canadian dollar. Both currencies gained against the U.S. dollar on Monday, but the peso weakened on Tuesday. One sticking point for Canada is the U.S. effort to dump the Chapter 19 dispute resolution mechanism that hinders the United States from pursuing anti-dumping and anti-subsidy cases. U.S. Trade Representative Robert Lighthizer said on Monday that Mexico had agreed to eliminate the chapter 19, something that Canada has strongly resisted. Trump has threatened he still could put tariffs on Canadian-made light vehicles if Canada did not join its neighbours and warned he expected concessions on Canada's dairy protections. If a deal is not reached with Canada, Mnuchin said on Tuesday, the United States would proceed with a separate trade agreement with Mexico. The Mexican government has also taken that position, even as it says it wants a trilateral deal. Videgaray said in Washington on Monday that scope for making changes with Canada to what the United States and Mexico had agreed was "significantly larger" this week, though he did not rule out alterations after that. "But it would certainly be much better to have an understanding by the end of the week," he told reporters. He also said his country was prepared to go it alone without Canada. "We already know that there will still be a deal between Mexico and the United States." If talks with Canada are not wrapped up by the end of this week, Trump plans to notify Congress that he has reached a deal with Mexico, but would be open to Canada joining, Lighthizer told reporters on Monday.